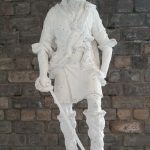 Fundraising for the new Rob Roy statue has been going well and the Rob Roy Preservation Trust are hopeful that Rob Roy will soon be back on the rock where he belongs. 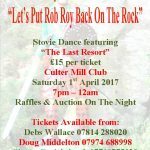 The Rob Roy Preservation Trust held a fundraiser on Saturday 1st April 2017 at the Culter Mill Club to raise funds towards putting the new Rob Roy statue back on the rock. The Rob Roy Preservation Trust are to hold a fundraiser on Saturday 1st April 2017 at the Culter Mill Club to raise funds towards putting the new Rob Roy statue back on the rock. The Stovie Dance from 7pm to midnight on Saturday 1st April 2017 will feature “The Last Resort” with raffles and an auction on the night.